Thanks to Fabrizio Moretti and David Zwirner gallery, Jeff Koons arrives in Florence, for a meeting between Florentine Renaissance spaces and works and the artistic protagonists of our time. From 26 September – 28 December 2015 two works of art by Jeff Koons are exhibited in Palazzo Vecchio. 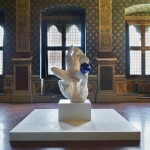 Pluto and Proserpina on the Arengario of Palazzo Vecchio, Piazza della Signoria and Gazing Ball (Barberini Faun) in the Lilies Room of Palazzo Vecchio. The exhibition is organized with the collaboration of Biennale Internazionale di Antiquariato di Firenze. 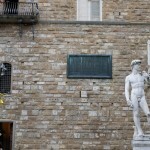 In Piazza della Signoria, not far from the marble copy of Michelangelo’s David, Pluto and Proserpina (2010-2013), absorb and mirror all the surrounding space. A huge work reaching over three meters, made in mirror-polished stainless steel, with transparent color coating and live flowering plants. The two figures of Pluto and Proserpina, clinging to each other in a sensual embrace, shine in the daylight and, illuminated by night, are bound to create a jarring contrast with the pieces in marble and bronze in the square. The choice of exhibiting Gazing Ball (Barberini Faun) in the Room of the Lilies, a lavish environment decorated with precious frescoes by Domenico Ghirlandaio (1449-1494) and a tromp l’œil tapestry displaying the Angevin golden irises in a blue field, shows the intention of creating a dialogue between the Renaissance artistic language and the contemporary one. When I asked him if he felt at ease with the polarities between Renaissance and classical art and contemporary art, of which he spoke in the press conference, he replied in a positive manner, citing the example of the Greeks who inserted art into everyday life. Happy to be in Florence, he described his presence here with enthusiasm and astuteness. He was extremely courteous and without any pretences.